AFTER Lebanon, I was off to Jordan. Jordan is an almost-landlocked country with an official population of around ten million; its only outlet to the sea is in the far south around the Red Sea port of Aqaba, just east of the Israeli port of Eilat. ‍Map of Jordan and Environs. Map data ©2018 Google, Mapa GISrael, ORION-ME. Like other countries in the region, Jordan was carved out of the remains of the Ottoman Empire after World War One. From the 1920s until 1949 Jordan contained no territory west of the River Jordan and was therefore known as Transjordan. A bridge over the Jordan river on the road between Jerusalem and Amman, known as the Allenby Bridge after the British First World War general Edmund “Bull” Allenby, who captured Palestine and Syria from the Ottoman Turks, was the most important crossing-point between the territory thereafter known as Palestine and controlled by the British, and the new Transjordan kingdom. In reality the British had no quarrel with local Muslims as such, many of whom were on their side against the Turks, and would have been most anxious to play down any parallel with the Crusades lest it only lead to trouble. In 1949, Transjordan gained the area known as the West Bank from British-administered Palestine, the rest of which had just become Israel. Transjordan was duly renamed Jordan since it now had territory on both sides of the river and was no longer ‘trans’. After the six-day war in 1967, the West Bank was occupied by Israel and Jordan was once more effectively reduced to its old boundaries. In 1994 Jordan signed a peace treaty with Israel, one of only two Arab countries to do so, the other being Egypt. Jordan is a constitutional monarchy headed since independence by the Hashemite dynasty. The present King of Jordan is named Abdullah II. The kingdom has high levels of literacy and human development and is regarded as one of the most stable countries in the Middle East and a major tourist destination. There is some industry, thanks to the existence of an educated workforce; and Jordan also exports phosphates and other minerals. In religious terms, the country is 95% Sunni Muslim; most of the remaining 5% are Christians. Three and a half-million of Jordan’s current population are refugees or descendants of refugees. There is a longstanding population of refugees from Israeli-occupied Palestine, along with a more recent influx of refugees from Syria, Iraq, and other war-torn places. In a conflict known as Black September, because most of it happened in September 1970, the Palestinian Liberation Organisation (PLO), under Yasser Arafat, tried to overthrow the Jordanian monarchy, which they saw as too soft on Israel. Three Western airliners were hijacked by a branch of the PLO known as the PFLP and flown to remote airstrip in Jordan known as Dawson’s Field, where they were eventually emptied of their passengers and blown up in front of the world’s press. In return the PLO activists were expelled from all the territories that the Jordanian monarchy controlled. This led to the formation of a more ruthless group called Black September, which killed eleven Israeli athletes and officials plus a local police officer at the Munich Olympics in 1972. Black September were in turn hunted down by the Israeli intelligence service Mossad; and so on, down to the present day. These days, the Allenby Bridge is treated as an international frontier crossing, jointly controlled by the Jordanians and the Israelis. Jordan’s capital is Amman, a city founded in ancient times and known in those days as Philadelphia, the city of brotherly love: the original Philadelphia, after which the American city is named. In the local circumstances, you can’t help thinking that the name is a bit ironic. 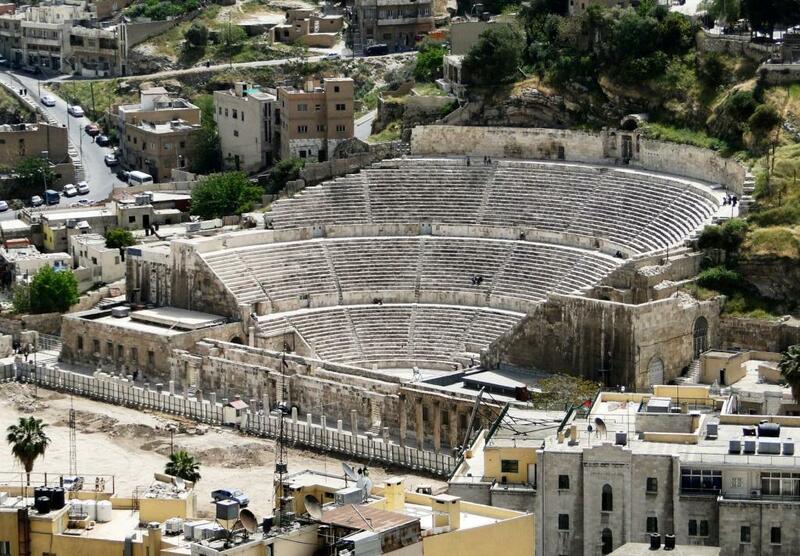 The greatest surviving landmark from the days when Amman was Philadelphia is a 6,000-seat Roman amphitheatre, perfectly intact and usable to this day. ‍The Roman Amphitheatre, Amman. Wikimedia Commons image by Bernard Gagnon, CC-BY-SA 4.0. I arrived in Amman at the end of a long day waiting in airport lines at Beirut. It was only a short flight but getting ready to board the plane took all day. I checked into the Boutique Hotel in Prince Mohamed Street, downtown Amman. It was run by Ali, an Iraqi refugee who had been in Amman for eight years. Then I went to the Al Pasha bathhouse and had a three-hour soak and scrub, which cost 51 Jordanian Dinars. The Jordanian Dinar is worth about one and a half US dollars, so the spa treatment came to about 75 dollars US. In the Al Pasha, I met a woman called Rose who was Palestinian but lived in Saudi Arabia and Dubai. 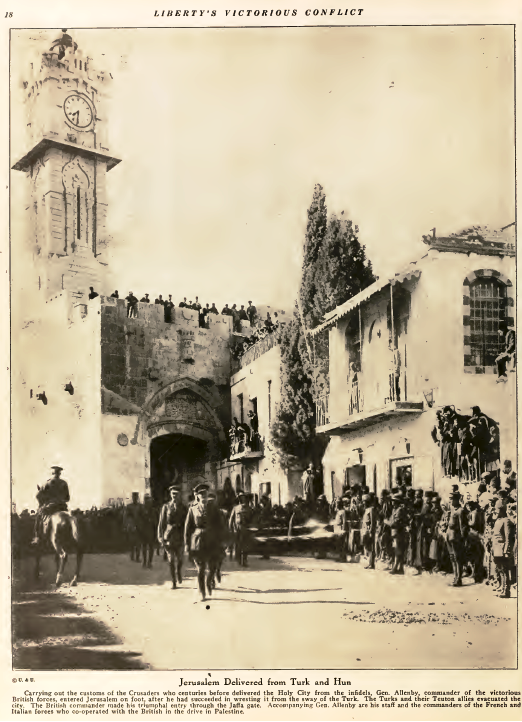 Rose returned from time to time to Ramallah, where she was born. Her niece, also Palestinian, was about to get married in Amman. The bride’s clothes looked amazing, all pink and other bold colours. The festivities were scheduled to go on for two days. The Boutique Hotel cost twenty Dinars a night for a nice, clean, one-bed room. Ali, the manager, said that he made money, but that the Syrian war had made life hard for many Jordanians. Unemployment was now at 35 per cent, and oil supplies that used to come from Iraq via Syria had been shut off. In June, Saudi Arabia, the United Arab Emirates and Kuwait bailed out the Jordanian economy to the tune of US $2.5 billion, fearing that a revolution might break out if nothing was done to help the Jordanians cope. This was July, getting toward the height of summer. So, on day two, I got up at six am to walk around the town while it was still cool. More-or-less by accident, I climbed one of the city’s seven hills to reach the Amman Citadel, close to where the famous amphitheatre is located, along with an Umayyad palace and a Byzantine cathedral. There are plenty of layers of history in this town! I climbed another hill, that had some ancient Greek ruins on top. Also next door to the Citadel was the Bedouin Museum. The Bedouins are the nomadic, desert-dwelling Arabs who traditionally used to live in tents and herd camels and other livestock while living by strict codes of hospitality and honour. Syrian Bedouin Khalil Sarkees with wife and child, at the World’s Columbian Exposition, Chicago, 1893. Source: 1893 exposition record, section titled The Bedouin Chief and Family. The hat worn by the woman looks a lot like the one I picked up in Bsous, Lebanon! In those days, Syria was an Ottoman province that included today's Lebanon and Jordan. 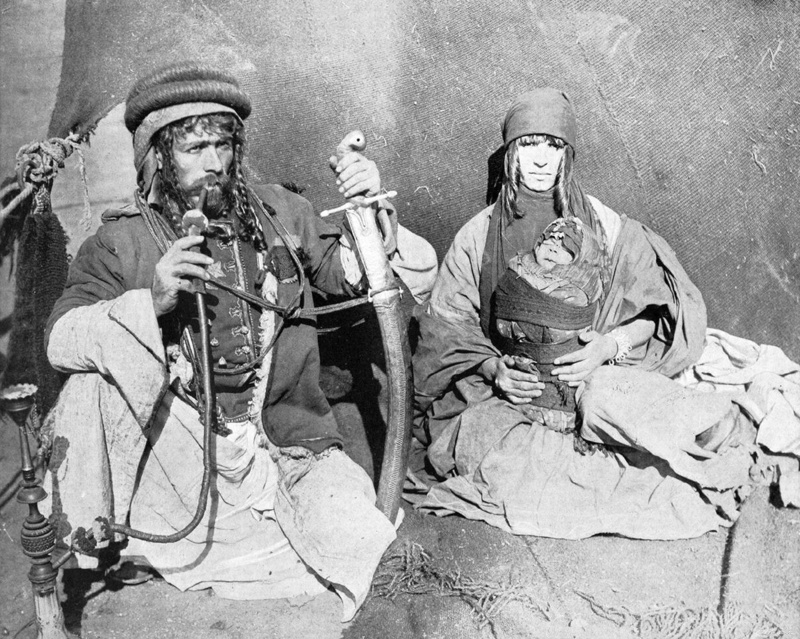 Often considered exotic by Westerners — think Rudolph Valentino in The Sheikh, or for that matter the family above — the Bedouins have long been regarded by many in the Middle East as the most culturally ‘original’ Arabs, as opposed to those who live in cities and are no longer so different to anyone else. Indeed, the historic meaning of the word Arab is desert-dweller, i.e., Bedouin. About a third to forty per cent of Jordan’s population are Bedouins, and they are regarded as the ‘backbone of the kingdom’, though ironically enough most Jordanian Bedouins now live in the city. In the Bedouin museum, there were photographs of women with dotted tattoos on their faces. There were waterproof tents made out of camel and sheep wool. I loved the clothing, the daggers, and how they lived and made food from sheep milk, truly amazing. I wasted a bit of time on day three, as the public-access opening hours and requirements of most places weren’t listed on the websites, so you had to take potluck. This particularly applied to mosques. I had to return twice to the King Abdullah Mosque, the big beautiful blue mosque, as I was expected to wear a long dress and they didn’t have any for hire. I’m glad I went back though, as it was gorgeous both outside and in, and well worth it. 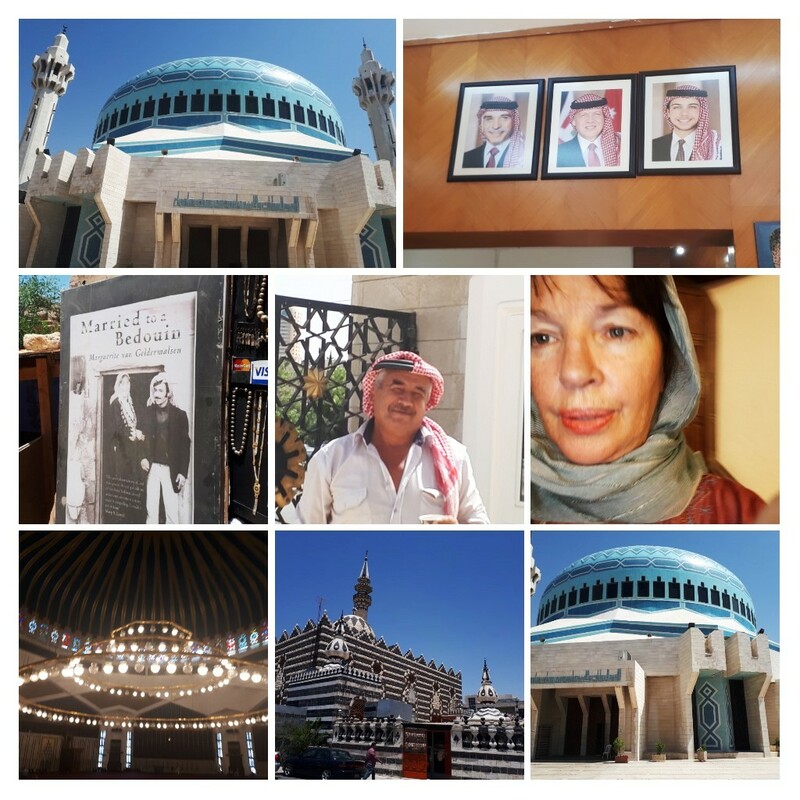 Some of my photos, including Amman’s King Abdullah and Abu Darwish mosques and the cover of Marguerite van Geldermalsen’s book Married to a Bedouin, which I talk about further below. 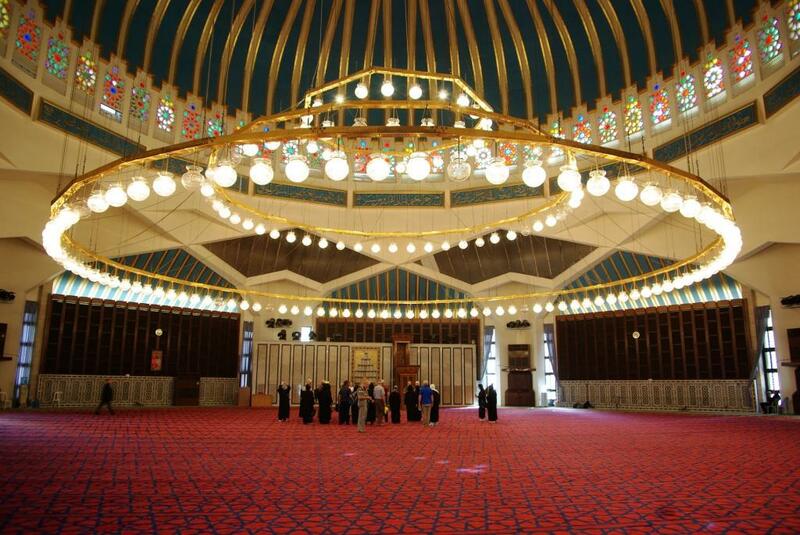 ‍A better view of the interior of King Abdullah Mosque interior, Amman, Jordan. Wikimedia Commons image by Berthold Werner, CC-BY-3.0. One thing I didn’t realise until recently was that mosques often have stained glass windows, just like Christian churches! You can see some in the photograph above. The King Hussein Mosque was a long drive out of town and turned out to be closed. On the other hand, I was able to visit the Abu Darwish Mosque, a striking black and white structure with a cavernous interior, big enough for seven thousand worshippers. I also tried to get into the Royal Hashemite Court, another cultural attraction, but was told by the guards that it was only open on Wednesdays. In Amman I had arranged to meet Sarah, a woman of a similar age to myself who was based in London and Turkey. I had met her earlier in Beirut and we seemed to get on very well, with same sense of humour. This is the same Sarah who appears in my third Lebanon blog post. 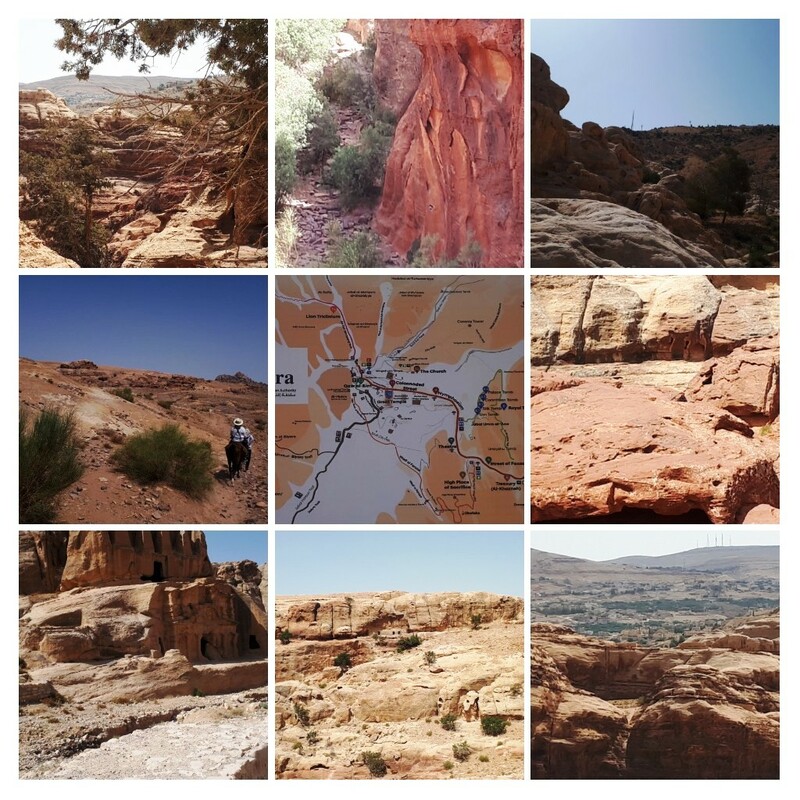 We were headed for the ancient city of Petra, a city hewn out of rock, which is what ‘Petra’ means. We were planning a three-day trip. The cost of the bus to Petra was only 8 Dinars, and the taxi to the bus station only cost two Dinars. That was the cheap way to see Petra. But I was getting knackered and knew the heat could be up to 45 degrees Celsius — or 113 degrees Fahrenheit — which meant that it would be good to have an air-conditioned space we could dive into any time we needed to. So, we decided to hire a car and a driver for the duration. Sarah had contacted a driver when she organised accommodation at the Little Bedouin Camp near Petra. She had cancelled the accommodation and the driver saying he bargained too much, but then she relented. Her initial responses turned out to be correct. We met the driver, who was named Mohammed. The price for the car and driver was 525 US dollars for the three days. Just to have hired a car would have been 120 dollars. 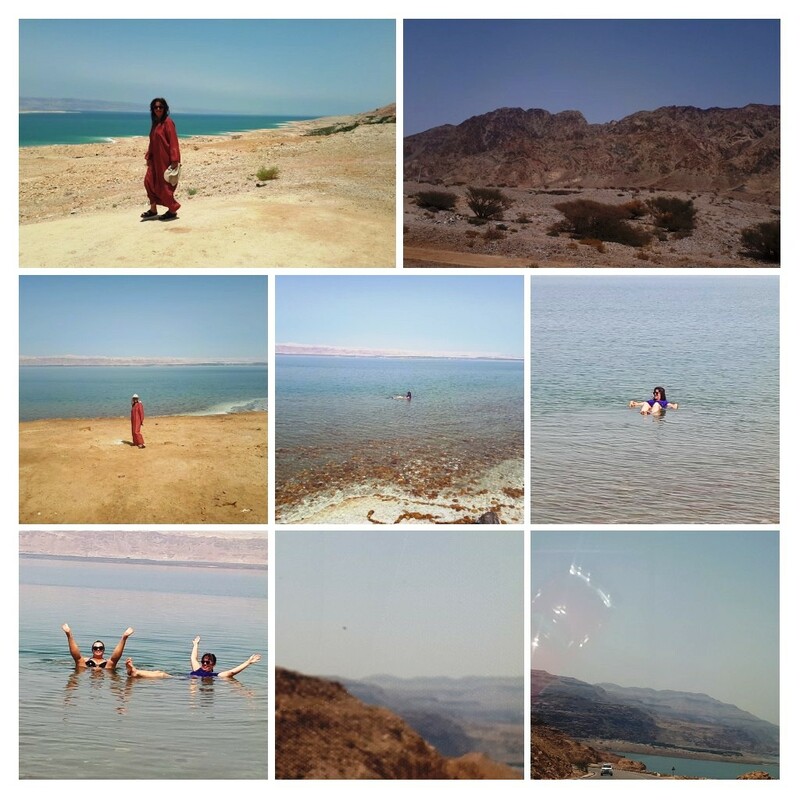 Our itinerary was to take us to the Dead Sea and then on to Aqaba on the Red Sea, where the Arabs had defeated the Ottomans in 1917 and liberated the region, as in the film Lawrence of Arabia. 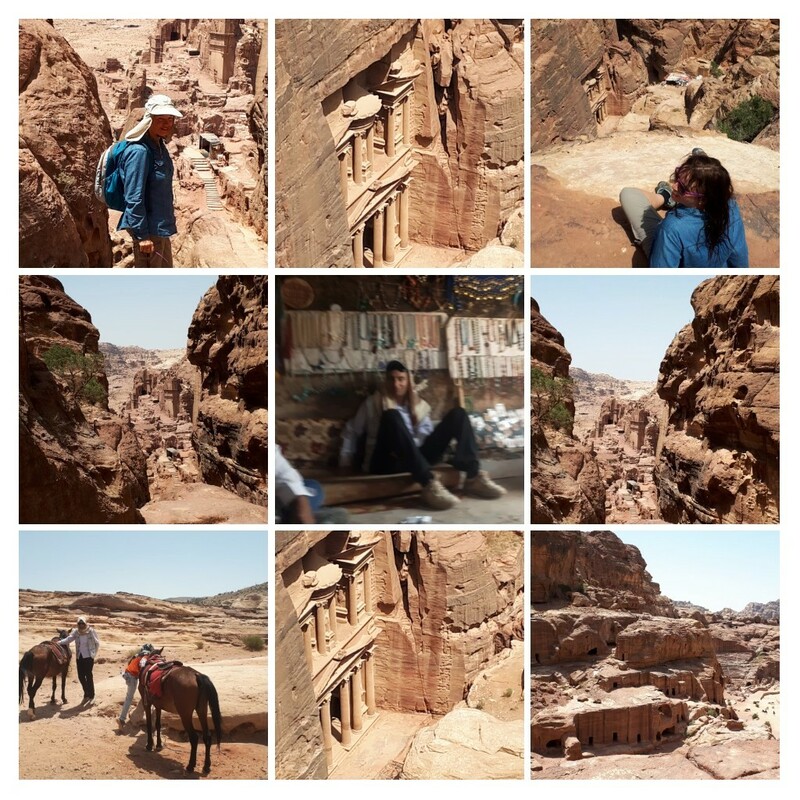 Then we were headed for Wadi Rum to take a camel ride, and then to Petra for two days to see the seventh wonder of the word and all its ancient rock-hewn buildings: the Treasury, the Monastery, and other things. And then to Madaba, and over the Allenby Bridge across the Jordan River, to Jerusalem. Our driver turned out to be a spoilt prince, who wanted a tip on top of the agreed price. When we were driving I had discover the meaning of the local sights and things from Google. I asked where things were, and he just said the road is the road and that was it. He proceeded to talk to friends on the phone for the next six hours. We went for a swim in the Dead Sea, but Mohammed said it was too hot and sat in the car. We swam for about an hour, and floated high in the water because it is so briny — the famous property of the Dead Sea waters, into which it is hard to sink — and we had to get a local guy to take a photo of us. We had a shower and then continued to Aqaba and had fresh fish for lunch with amazing salads. The heat suddenly rose to 44 degrees at 3 pm. We went on to Wadi Rum for a camel ride. We got there at 5:30 pm and we were going to see the sunset from the back of a camel on a ride that would supposedly take two hours, costing thirty American dollars, but we only went about one kilometre in the end. My camel was skinny and young, with the rather un-Middle Eastern name of Gordon; its saddle kept falling off. Sarah had a better camel. The camel guide, Omar, was a Bedouin; he showed us photos of the rain that comes down in the winter, and women dressed totally in black: it was amazing. He said to contact him directly next time. The valley was full of Bedouin camps and lights, although most of the people in the camp were actually city Arabs getting back to their roots. I wished I had taken more time so that I could have done an overnight camel ride and camping expedition. That would have been much more the real thing. After that we pressed on to Petra. Amidst the phone discussion, Mohammed said I should talk to another Mohammed, a chef where I was going to be staying that night. Apparently, Mohammed number two was in need of a girlfriend and Mohammed number one said I should proposition him. I politely declined. When we got to the camp outside Petra, called the Little Bedouin, I went to bed without having a shower, turned the light off, and didn’t even go to the café. The tent had a pokey window with mosquito netting over it and was really small. It was a lovely camp apart from that; but the showers were too open. Whenever I went to the toilet, Mohammed number 2 was in the gents, and to top it all off the bathroom door did not lock from the inside. The next day, unwashed, we proceeded to Petra. Sarah and I decided that we would travel through Jordan and Israel together for two weeks. 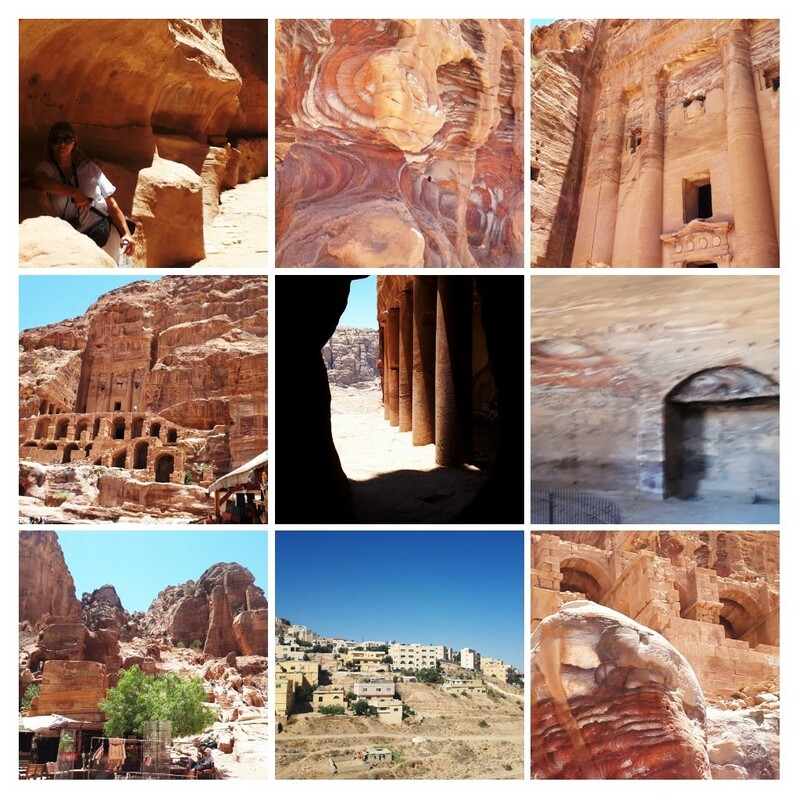 At Petra, Sarah found a great hotel with air conditioning, at last. No more camping. We went to the Visitor Centre Museum and were amazed by the age of the site. The city, in the heart of the Shara mountains, had been carved out of the rock more than two thousand years ago, around 100 BCE, by an Arabic people called the Nabataeans. The city, which the Nabataeans called Raqmu — Petra is a later, Greek name — had been on the trade routes between Egypt and Mesopotamia and had prospered as a result. The Nabataeans had organised an ingenious water supply system that collected rain in the gorges and led it to storage cisterns. Earthquakes in 363 and 551 CE progressively wrecked the water supply system. This was an important factor in Petra’s abandonment, along with shifting patterns of trade and deterioration in the local climate, which wasn’t quite so desert-like in ancient times. Anyhow, we got a two-day pass to explore the ancient city. This cost 35 dollars, and there was a two-hour night show that cost another nine dollars. Someone told me that the night show used to go on till one am and cost four dollars, so things have gone up. 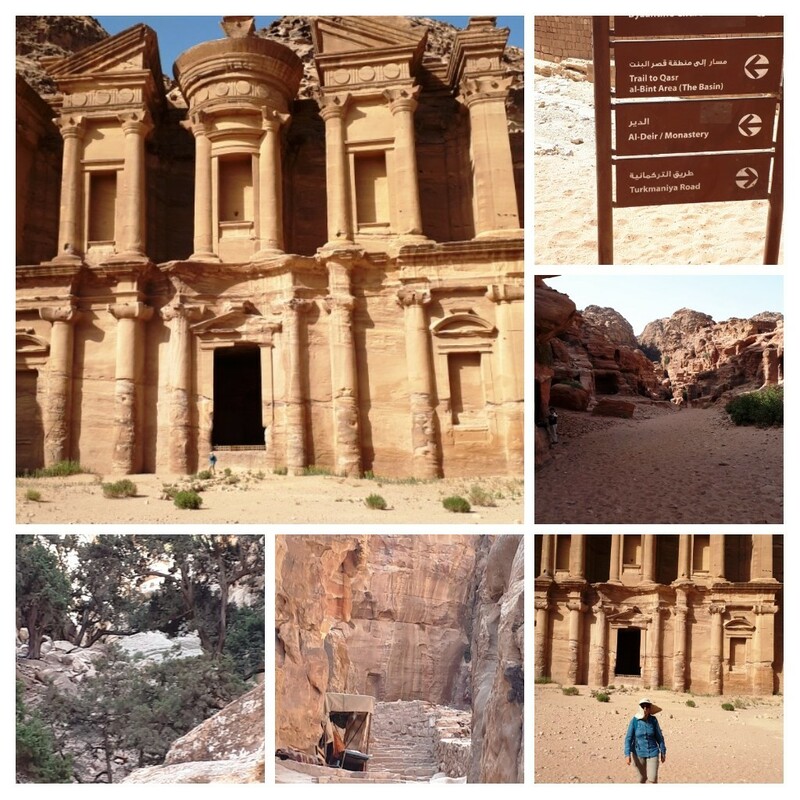 Most people only spend six hours at Petra, arriving at 8 am and leaving at 2 pm. Others spend three days there. We felt that that two days and night was a pretty good introduction. 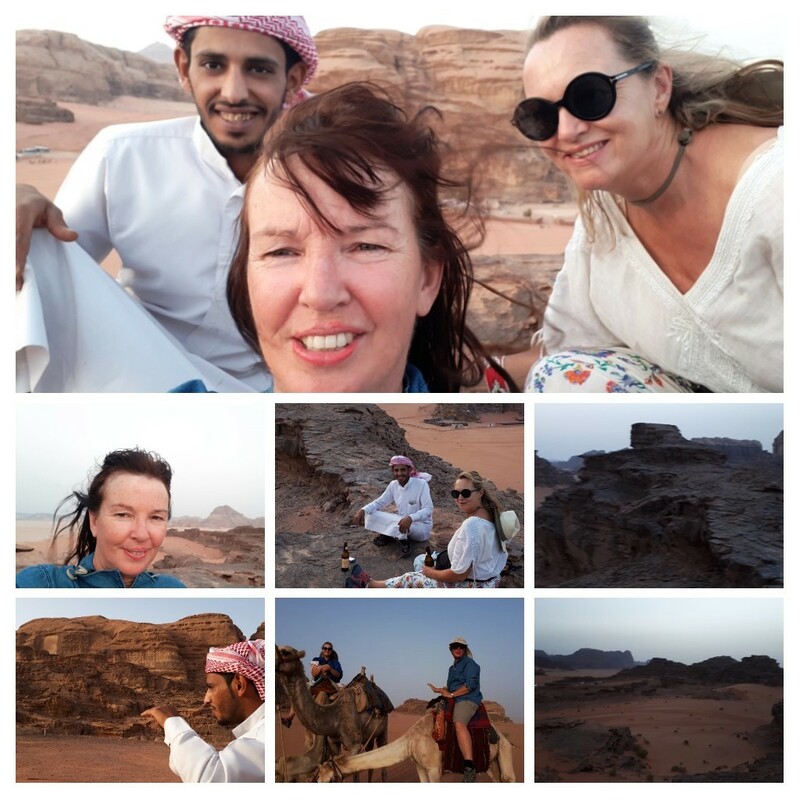 Anyhow, two horse riders came and offered to take us up to a lookout called the High Point, and then proceed to the High Place of Sacrifice described in the book Married to a Bedouin, by the New Zealand author Marguerite van Geldermalsen. We paid $20 each to get to the High Point. My horse was old and skinny, and the saddle kept falling off just like the camel’s. In places the terrain was so rocky that we had to get off the horses and walk alongside. We got to the High Point and got wicked shots of the Treasury from there. The High Place of Sacrifice was on a plateau and was used for important religious ceremonies. The Treasury (al Khazna) is forty metres high and decorated with Corinthian figures. 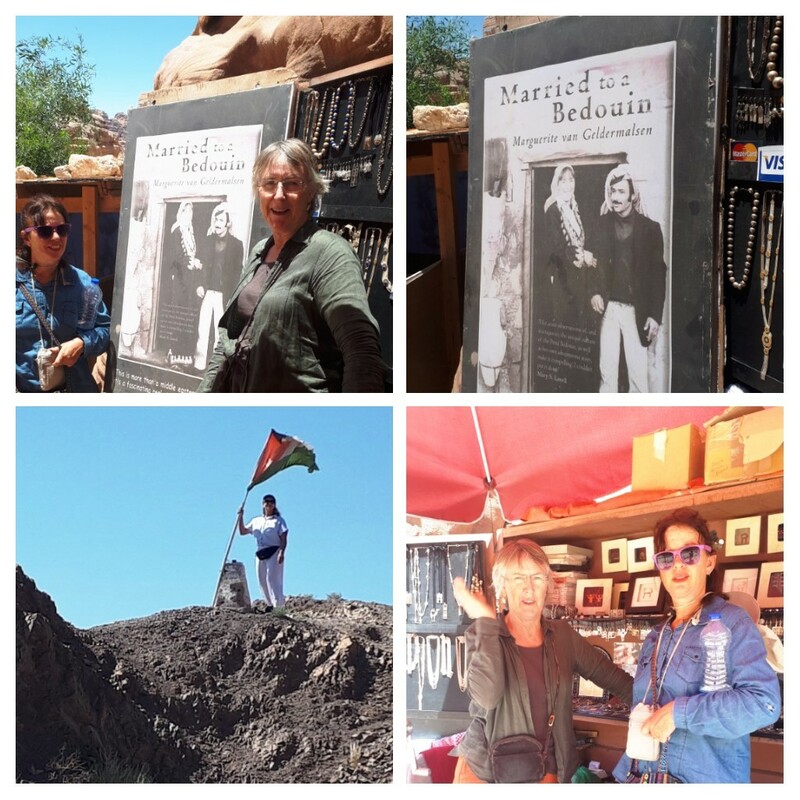 There were Bedouin at Petra, mostly living in tents; we bought jewelry off one man who lived in a cave. There were no toilets anywhere save at the Treasury, by the café and at the Monastery; so be warned. The local Bedouin were apparently displaced to some extent when Petra became a World Heritage site, though they have since come back. On the other hand we had heard that the tourism industry had collapsed more recently, because of all the turmoil and terrorism in neighboring countries like Syria and Egypt, and that many stallholders no longer made a living as a result. Tourists had gone, frightened out of the whole Middle East. But Jordan was safe and the people were welcoming everywhere you went; especially the Bedouin, who had gone back to herding sheep and other traditional pursuits for the time being. Most of the Petra is in a shady chasm. That was a smart place to build the city, for the heat was unbearable on the high plateau We stopped at a café before descending and drank water and coffee for a whole two hours. Then we went down and ended up looking at the amphitheatre and talking to a stall holder. We had heard of Marguerite van Geldermalsen, who still lived in these parts (her husband now deceased). We wanted to meet her. We were told that she had a stall in the market, and we went over and said hello. A well-travelled guy with lots of tattoos told us to go to the Monastery at the top of the hill. That was a tough climb in 44 degrees of heat. The Monastery is 47 metres wide and more than 48 metres tall. There is an altar inside; it dates back to the 2nd century CE. Visiting the Monastery was wonderful. We descended slowly and viewed some tombs, and then went on to look at the Theatre. This seats 4,000 and was carved into the rock by the Romans, the only Roman amphitheatre to have actually been hewn out of living rock in that way. We were shattered by this stage and rode out by camel to the Bedouin village nearby, a ride that only cost two dollars. We got back to Sarah’s hotel at 6 pm. I went and fetched my luggage from the camp, where I wasn’t going to spend another night. I also said to Mohammed the driver that we wanted to give him a night and a morning off and would walk the next day. In reality we just wanted to get away from a rather clueless young man. 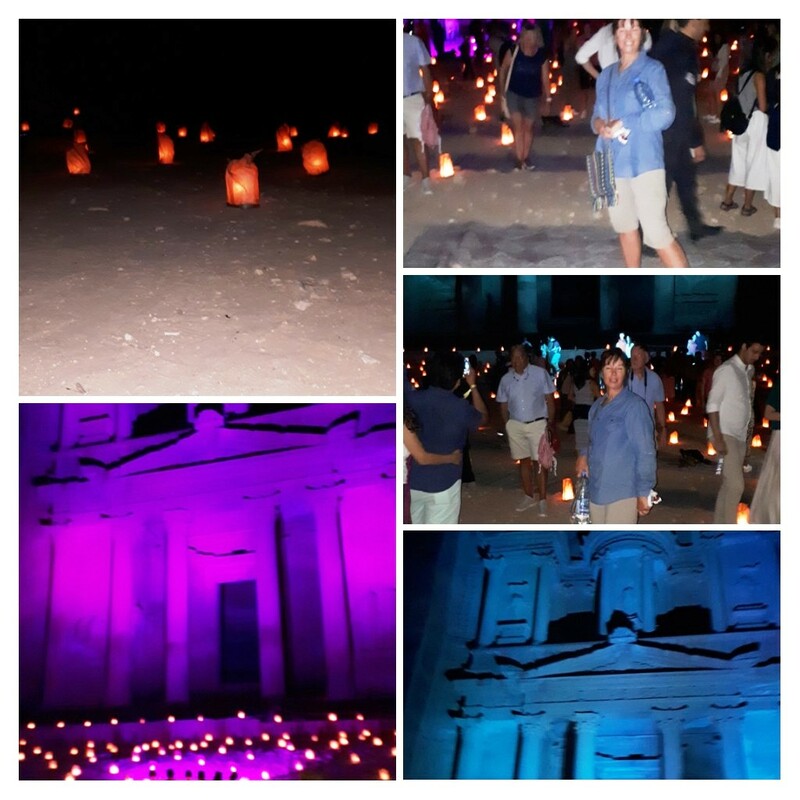 The night show was amazing, though access to Petra was restricted at night and we couldn’t wander past the Treasury. We were asked whether we wanted a front seat and were told to go to the front. A man was playing a stringed Bedouin instrument that looked a bit like a guitar. There were lots of coloured lights, and candles. The audience were supposed to stay back, about fifty metres from the stage. Sarah went straight to the front of the stage, though, and meditated. I lay down halfway between Sarah and where the audience were supposed to remain and felt a bit embarrassed. Sarah left and then there was a speaker, talking about the art of the Nabeateans and world peace. On the second day, we expored the traditional way into Petra, the Siq. The Siq is a natural gorge that leads people into a canyon where Petra is. There was a footpath with lights the whole way down: an absolutely magical place. We wandered through the Siq, to the Treasury and the tombs. We met Marguerite once more, and walked the Street of Façades, a system of tombs with cavettos and pilasters. We stopped at the Great Temple, constructed in the first century CE. Then we pressed on to the Royal Tombs. The Urn Tomb has a deep courtyard with colonnades on two sides. Later, it became a Byzantine church. The Silk Tomb is fascinating for its swirls of different-coloured rock that make up the façade. The artwork was just amazing on the inner ceilings, like nothing I’d ever seen before. Unfortunately, we had to leave to get to Madaba and the Allenby Bridge to Jerusalem. We were nervous about getting searched. What was it going to be like crossing into Israeli-held territory? Our driver asked us whether we would like to leave ahead of schedule, and also whether we could help him with money to start a hostel and other businesses. Sarah had fallen ill with stomach cramps and I had to organise another taxi to take us into Jerusalem on the western side of the Allenby Bridge. I charged her phone and she left it in Mohammed’s taxi. We never tipped Mohammed, and he never returned the phone. I gave the camp a bad review. After six days of travel, we were finally in Jerusalem.